Sister Marie Charles Grauer, a School Sister of Notre Dame who taught girls the finer points of grammar, composition and literature for more than three decades at the Institute of Notre Dame in Baltimore, died July 20 at Villa Assumpta in Baltimore. She was 96. Known as a strict disciplinarian, Sister Marie Charles quietly saved money to help pay the tuition of students whose families couldn’t afford it. She also visited local businesses to place hundreds of students in after-school jobs to help them with tuition. Some of those students are still with those companies today. Sister Marie Charles grabbed the attention of her students and kept it, Sister Hildie said. Born in Highlandtown, Margaret Mary Grauer grew up in Sacred Heart of Jesus Parish. Her father died when she was young. She was able to attend IND with the help of $50 left to her mother following the death of an uncle. She entered the School Sisters of Notre Dame in 1943, taking “Marie Charles” as her religious name. 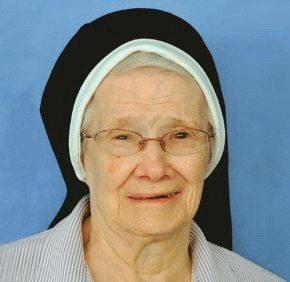 Sister Marie Charles, who held a bachelor’s degree from what is now Seton Hall University in New Jersey and a master’s degree from what is now Loyola University Maryland in Baltimore, served as a teacher in New Jersey before teaching at St. Ann School in Baltimore, Mount Calvary School in Forestville and St. Mark School in Catonsville. She taught at IND from 1968 to 2003. She fell and broke a hip in 2009, according to Sister Hildie. Sister Marie Charles was deeply committed to her faith, Sister Hildie said, catching a 5 a.m. bus every weekday to travel to morning Mass at Mercy Medical Center in Baltimore. Mary Helfrich, a 1980 IND graduate, called Sister Marie Charles a “tough but fair teacher.” Helfrich remembered that Sister Marie Charles urged her students to pay attention, often pointing out that their parents could be “taking a cruise” with the money they were paying for tuition. The teacher’s requirement that all her junior English students memorize and recite the Gettysburg Address was legendary, Helfrich said. A 10 a.m. funeral Mass will be offered July 28 at Villa Assumpta. Click here for more obituaries.